Gastric Bypass surgery causes malabsorption and restricts food intake, which produces more weight loss. Other procedures like gastric banding only decrease food intake. Bypass surgery patients generally lose two-thirds of their excess weight within two years. It is a sophisticated procedure that helps you lose weight by changing how your stomach and small intestine handle the food you eat. After the surgery, your stomach will be smaller and you will feel full with less food. The food you eat will no longer go into some parts of your stomach and small intestine that break down food. Because of this, your body will not absorb all of the calories from the food you eat. This procedure has helped millions of people worldwide lose their excess pounds and achieve healthier lifestyles. Dr. Bernie Hanna is an experienced Las Vegas gastric bypass surgeon, who is recognized for his dedication to patient safety and satisfaction. If you are significantly overweight and wish to learn how gastric bypass can help you, explore the paragraphs and video featured on this page. Gastric Bypass is a laparoscopic procedure using small incisions to divide the stomach into a small upper pouch and a much larger remnant pouch. The small pouch is then reattached to the small intestine, allowing food to bypass a portion of the digestive track. It is the most involved procedure and the oldest of the three procedures. This surgery leads to a significant reduction in the functional volume of the stomach, which is accompanied by a change to the physiological and physical response to food. Gastric bypass surgery limits the amount of food that can be eaten at any one time by reducing the size of the stomach over 90%. A normal stomach can stretch, resulting in a size of over 1000 mL. After surgery, the small pouch may only be 15 mL in size and is usually formed from the part of the stomach that is least likely to stretch. 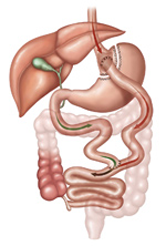 When the patient ingests a small amount of food, the stomach’s first response is to stretch the stomach pouch. This stretching stimulates nerves that tell the brain that the stomach is full, resulting in the patient having a sense of fullness. The fullness will feel as if a large meal was eaten with just a small amount of food, and the patient will feel full for a longer period of time. In addition, by bypassing a portion of the intestine the body absorbs fewer calories. As less food is eaten, and fewer calories are absorbed, the body will stop storing excess calories and start using its fat supply for energy. The first step toward improving your health and your life through gastric bypass surgery is to schedule a personal consultation with Dr. Hanna. He will perform a series of tests and medical evaluations to determine whether you are a gastric bypass Las Vegas candidate. Dr. Hanna will then explain exactly how this surgery is performed and what you should do to prepare for it. Important preparations include a healthy diet and moderate exercise. Smokers should quit smoking at least one month before surgery because smoking interferes with proper blood flow and healing and might lead to complications. Tell Dr. Hanna or his staff if you need help quitting. Prior to your surgery, you may be asked to stop taking aspirin, ibuprofen (Advil, Motrin), vitamin E, warfarin (Coumadin), and any other drugs that make it hard for your blood to clot. Be sure to confirm with Dr. Hanna’s staff what you can still take on the day of your surgery. If you are ready to change your life and lose your excess pounds for good, contact the weight loss surgery Las Vegas offices of Dr. Bernie Hanna today by calling (702) 384-1160 or by clicking here. If you are not a gastric bypass candidate, Dr. Hanna might be able to help you by performing another type of bariatric surgery, such as Lap Band or Gastric Sleeve in Las Vegas. In addition, he performs secondary weight loss surgery and is regarded as a top Las Vegas revision bariatric surgery provider.